Closed system catheters are the cathing system most preferred by patients who use wheelchairs, or those who experience frequent UTI’s. 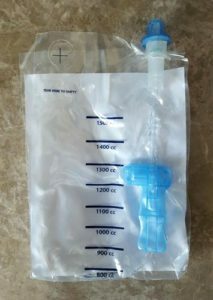 This closed system catheter provides private and convenient cathing for complete discretion anywhere you might be, even in your car. Experience effortless insertion with a pre-lubricated insertion tip, as well as trouble-free disposal with this complete system. Closed system catheters differ from other catheters because they have an added safety feature called an introducer tip or insertion tip. This allows the pre-lubricated catheter to bypass bacteria located in the first few millimeters of the urethra, which significantly reduces the risk of infection. The collection chamber allows the user to measure output and monitor hydration levels. There are also closed system catheters specific to the needs of those with limited hand dexterity. Ease of Use: Prehydrated and ready to use right out of the package. Contact New Britain Medical Supplies today to learn more about this great product. We take pride in our superior personalized service, as well as broad knowledge of our products. Whether you are new to NB Medical, or a familiar face, contact us today to find out more.